Coffee is one of the world’s most popular drinks. Other than being popular and available across every corner shop, the drink features a bunch of benefits. The calorie count is low meaning you can enjoy the flavored beverage with no diet scare. It also helps the body with cognitive functions and brain alertness. The presence of antioxidants makes it even more beneficial. There are two main formulations in which coffee appears; either ground or instant. In terms of usage, instant coffee is a good additive to food and other beverages as its preparation process is very time efficient. The aroma, however, is not as strong as that of ground coffee. The fundamentals used to differentiate the two formulations are the type of beans used and skills used to process. Instant coffee is sometimes referred to as soluble coffee. This beverage is a product of coffee beans that have been processed to make the whole process simple for the consumer. All you have to do to enjoy instant coffee is to add it to a cup or glass then add some water and stir. The amount put gives a different texture to the coffee, from little coffee water to thick coffee syrup. The syrup can be made by adding a larger amount of instant coffee to water mixed with sugar to create a thick mix and can be used together with other beverages such as milk. When it comes to manufacturing, instant coffee goes through the same process of roasting in combustion cylinders. however, to get the essence of instant coffee, it is extracted as soluble and volatile contents from the coffee beans. Concentration is be made more potent through the processes of freeze evaporation or evaporation. What is a Ground Coffee? Ground coffee is a coffee bean that has already been grounded without passing through any industrial processing. Although most coffee fanatics prefer ground coffee to instant, the freshness does not last so long when left out in the air and might lose the coffee essence and flavor. The preparation process is not as easy as that of instant coffee where you just mix with water and stir. Making fresh ground coffee is an art that requires special equipment to brew the drink. Today there are many handy equipment in the market, that reduce the processing time. This however can’t much up to instant coffee processing which can take seconds to brew. An added advantage of ground coffee is the fact that the caffeine content is much higher as most of its essential oils are preserved giving the drink a richer aroma. In the market, ground coffee is slightly pricier than instant coffee. Preparing instant coffee is as easy as 123. There is no rocket science into making instant coffee all you need is some coffee powder in a cup then you can add some hot or cold water to it and have it on the go. This is ideal for busy people who do not have the minutes to prepare ground coffee. As for ground coffee, it takes time as you have to use the specialized equipment to prepare the drink. Ground coffee tends to have better flavor variety since all its essential oils and chemical compositions are intact. Instant coffee loses some flavor and aroma due to the chain of processes it has to go through. The fresh coffee taste of ground coffee also makes it sweeter avoiding a generic taste as coffee enthusiasts boast. Ground coffee requires some dedication in terms of energy and time. It also requires the use of special equipment to create the drink. It requires filters, coffee makers, moka pots e.t.c. On the other hand preparing instant coffee requires very minimal equipment ( spoon and cup). Instant coffee is slightly cheaper than ground coffee. Coffee enthusiasts, however, often opt for the pricier ground coffee option due to the high caffeine content and flavor. Ground coffee has a shorter shelf-life compared to instant coffee. 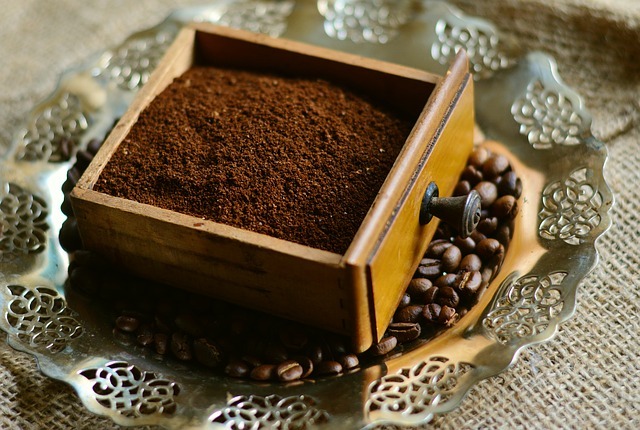 Ground coffee should be stored in airtight containers to prevent it from losing its potency. Instant coffee has a longer shelf-life and has no particular storage requirement, as long as the containers are dry and clean. When it comes to preparing coffee at home, instant coffee does not produce any by-products. However, the process of ground coffee preparation releases some by-products (coffee fibers) which have to be disposed after. Ground coffee has more caffeine than instant coffee. This is because instant coffee loses some of its concentrates in the manufacturing process. The other name for instant coffee is soluble coffee. Ground coffee is much richer in flavor compared to instant coffee. 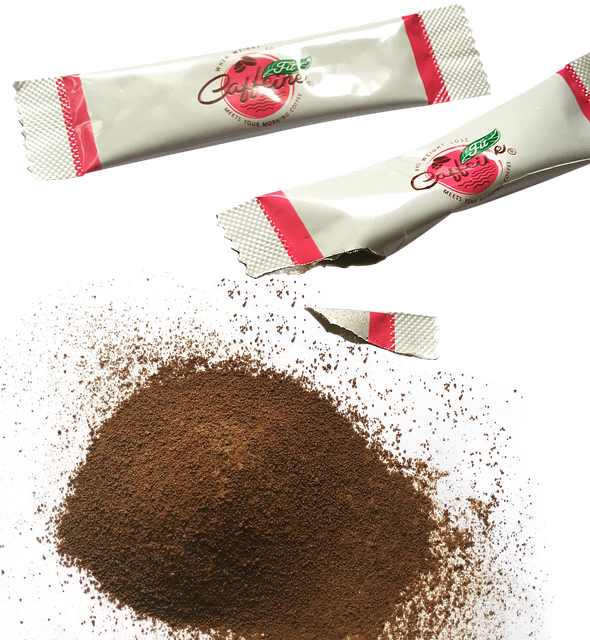 Instant coffee is available as granules or in powder form. Both instant and ground coffee have a low-calorie count. Ground coffee has a higher caffeine count when compared to instant coffee. There are no by-products for instant coffee. Ground coffee has a shorter shelf lifespan. Both instant and ground coffee have an equal amount of antioxidant count. Freeze drying is the best procedure for making Instant coffee. Making ground coffee takes more time when compared to instant coffee. Ground coffee needs external equipment such as a Moka pot used during extraction. Evah Kungu. 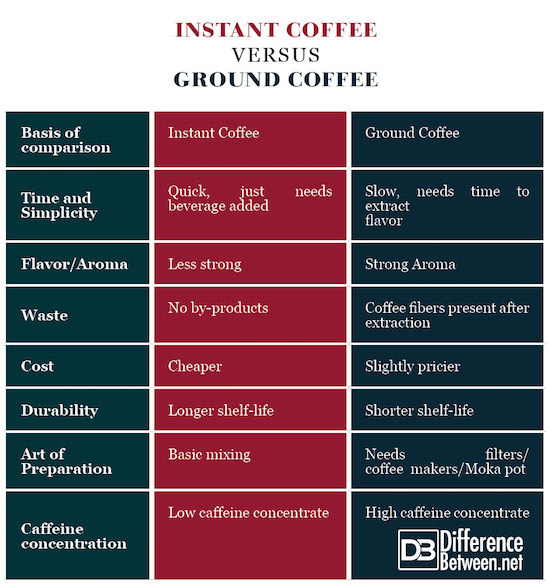 "Difference Between Ground Coffee and Instant Coffee." DifferenceBetween.net. July 30, 2018 < http://www.differencebetween.net/object/comparisons-of-food-items/difference-between-ground-coffee-and-instant-coffee/ >. Institution, B. S. (1986). Coffee and Coffee Products: Instant coffee: determination of insoluble matter content. British Standards Institution. Neoh, T. L., Adachi, S., & Furuta, T. (2016). Introduction to Food Manufacturing Engineering. Springer. Chu, Y.-F. (2012). Coffee: Emerging Health Effects and Disease Prevention. John Wiley & Sons.